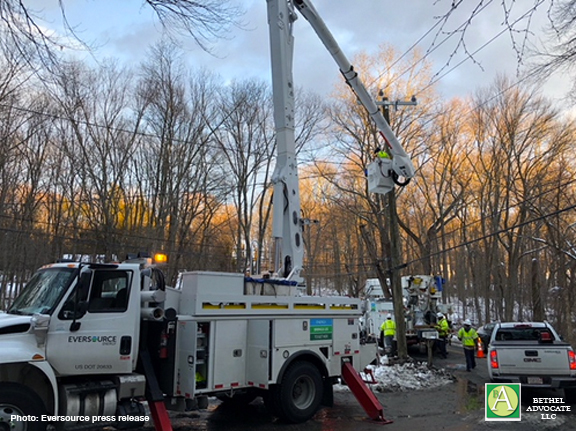 BERLIN, Conn. (March 11, 2018) – Eversource’s massive, around-the-clock restoration effort continues in high gear to get power back for customers still affected by Wednesday’s destructive nor’easter. Working in challenging conditions for the last several days, Eversource crews with the help of hundreds of utility workers from around the country, have restored power to more than 243,000 customers, replaced approximately 400 utility poles and strung more than 110 miles of new overhead lines – all while the company closely tracks the next storm expected to hit Connecticut Tuesday morning. Crews are focusing on the remaining single or scattered outages. These are more complex outages that take additional time to complete and may require assistance from a private electrician or contractor. Lineworkers are going to each of these individual locations to assess what additional equipment or effort may be required to make repairs. The company is also keeping a close eye on the next storm. 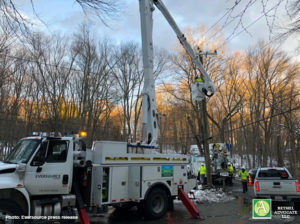 Eversource line and tree crews, along with many of the out-of-state workers already in Connecticut, will again be ready to respond to the storm expected to hit the region Tuesday morning, bringing more snow and wind. Eversource recommends customers assemble or restock a storm kit with essential items before the next storm hits. These include water, non-perishable food and pet food, as well as adequate medical supplies and prescriptions for each family member and any pets. The company also suggests customers keep all wireless communication devices fully-charged in case of a power outage. Eversource (NYSE: ES) transmits and delivers electricity to 1.2 million customers in 149 cities and towns and provides natural gas to 229,000 customers in 73 communities in Connecticut. Recognized as the top U.S. utility for its energy efficiency programs by the sustainability advocacy organization Ceres, Eversource harnesses the commitment of its approximately 8,000 employees across three states to build a single, united company around the mission of safely delivering reliable energy and superior customer service. For more information, please visit our website (www.eversource.com) and follow us on Twitter (@EversourceCT) and Facebook (facebook.com/EversourceCT).